I watched this some time between 1998 - 2003. It was a TV miniseries (maybe 8-12 eps I think), about a boy (age 11/12 I think) that gets transported to a magical world. At some point he pairs up with an older (or possibly just taller) girl, who is from that world. At some point they go to a castle that has big colourful creatures of some kind. In one of the later episodes they go across a wooden bridge over a chasm. I watched it in the UK, I can't recall if it was UK, Australian or USA but definitely in English. Unfortunately that's all I can remember! 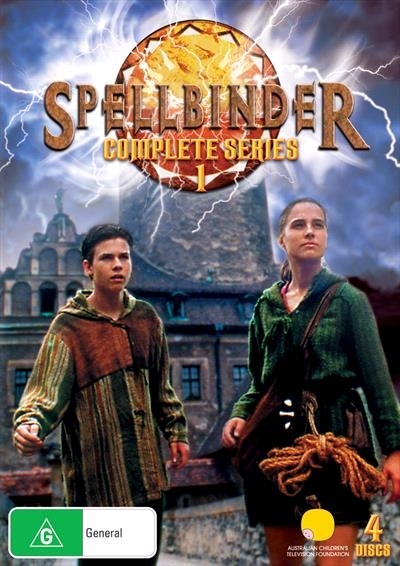 I think it could be Australian/Polish co-production Spellbinder (1995). While at summer camp, Paul Reynolds accidentally goes into a parallel universe. This other world is inhabited by a more hierarchic and technologically different society, ruled by a group of people known as Spellbinders. Paul meets a girl there named Riana, and they become friends. The Spellbinders have discovered the power to create and manipulate static electricity. They fly in gigantic copper-coloured machines that utilise large rotating orange crystals, presumably creating some form of magnetic levitation. The Spellbinders often use their power for good, but some abuse this power and use their discoveries for malevolence. One such malevolent Spellbinder is Ashka, who often manages to hide her true nature. Common people are often "banished" for their misdeeds, and sometimes Spellbinders are banished, also, if they are proven to have done wrong. It has a sequel, Spellbinder: Land of the Dragon Lord (1997). It has the boy and older/taller girl (see picture) and strong science fantasy elements. I don't remember the colorful creatures, and I'm not sure about the wooden bridge over a chasm. It has, however, been 20+ years since I saw it. Could it be Josh Kirby... Time Warrior!? The series concerns a device, found by humans in the 25th century, called the Nullifier. This device is said to be capable of destroying the universe. Realizing the danger, a man called Irwin 1138 splits the Nullifier into six pieces, which are then dispersed through time. However, a scientist called Dr. Zoetrope finds out where the pieces are located and, with the help of his time traveling armor, sets about reassembling the device. Along with 20th century teenager Josh Kirby, and a half-human warrior known as Azabeth Siege, Irwin 1138 sets about thwarting Dr. Zoetrope's plans. Josh Kirby is 14 years of age in 9th grade and his journey starts when he is accidentally pulled into the fight between Irwin and Zoetrope when a piece of the Nullifier lands in his time. He has to overcome his homesickness for small-town America, helped by befriending the alien warrior-girl Azabeth, and saving her life, a result of this being that she is bound by oath to protect him. After a series of adventures including seeing the year 70,379 where humans have become tyrannical giants, a world populated by living toys, and Azabeth’s home world where humans are the hated enemy of her people, The Kang, he eventually is confronted by a shocking betrayal by Irwin before he discovers that he must choose between Azabeth's survival and fulfilling his Time Warrior destiny. Animated movie where boy get transported to another world and is helped by shape-shifters.